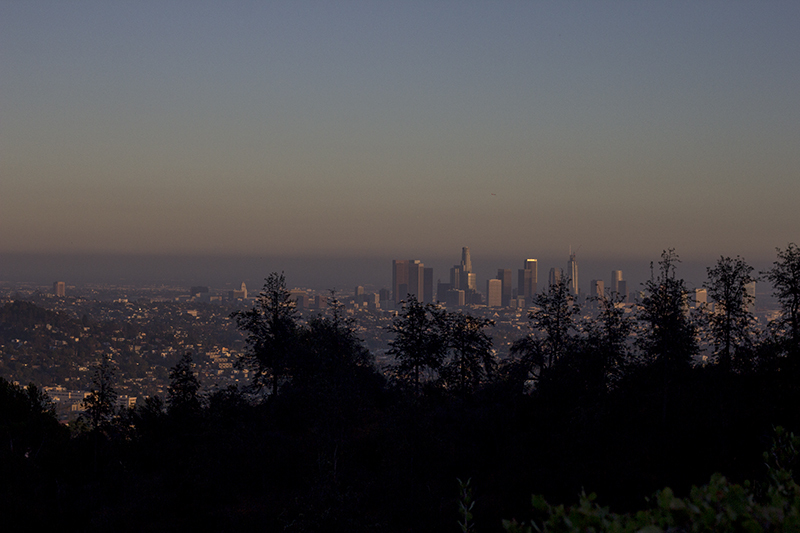 Los Angeles was one of those places that I had always wanted to visit. In fact, the US in general was one of those places on my list that I had never got around to. We decided to bite the bullet and head over to LA and make it our first transatlantic flight. Living in the UK, your impression of Los Angeles is completely made up from what you see on TV and movies. We didn’t have much of an itinerary of things to do when we were visiting, which in hindsight was a mistake as we didn’t realise how big Los Angeles actually is (Spoiler: it’s huge) and getting around takes quite a bit of planning and time, but we did what we had time for and I think that we had a pretty awesome trip. 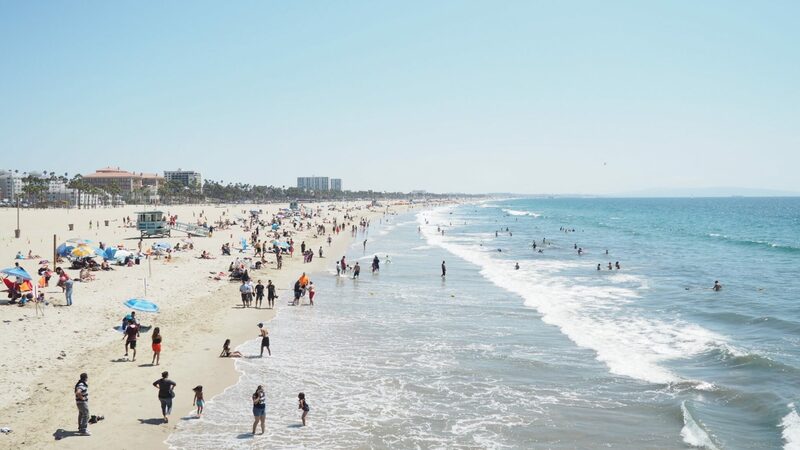 With this in mind, we have put together a guide of our experience with the city and the best things to do in LA as a tourist when visiting from overseas. We spent ten days in Los Angeles, so I guess you could build a bit of a Los Angeles Itinerary for 10 days using the things that we’ve listed in this post. As we’ve said already, Los Angeles is huge and there’s no way that you could walk from place to place. Don’t even bother trying. Streets literally run for miles and although two places may be on the same street, they will probably be hours apart by foot. So here are our best suggestions for getting around LA. Uber was our main method of travel when we knew locations were quite a distance apart. It was a lot cheaper than we had anticipated and the Uber app makes the experience simple, and from our experience safe. You can see exactly who your driver is and their current review score then you can make the decision on whether you feel you are happy to accept the ride from this driver or cancel before they arrive. We had good experiences with our drivers, they were friendly, efficient and helpful when it came to telling us some of the places that we should (and should not) go. Our second method of getting around the city was to use the Los Angeles Metro rail which is somewhat similar to London underground. We had read prior, and did notice that this is not as popular with the locals but it can help you get to many of the main tourist attractions. There was often a bit of a walk to get from the stations to where you want to be and they didn’t seem to have as many stations as most other cities. Trains were clean and in order to ride, you must purchase what’s known as a TAP card (much like Londons Oyster card) and top it up with credit. You can grab a card and top them up at the machines in most stations. Just make sure that you do tap your card at the gates of every stop before you ride and after getting off to avoid being fined by the random inspection patrols. 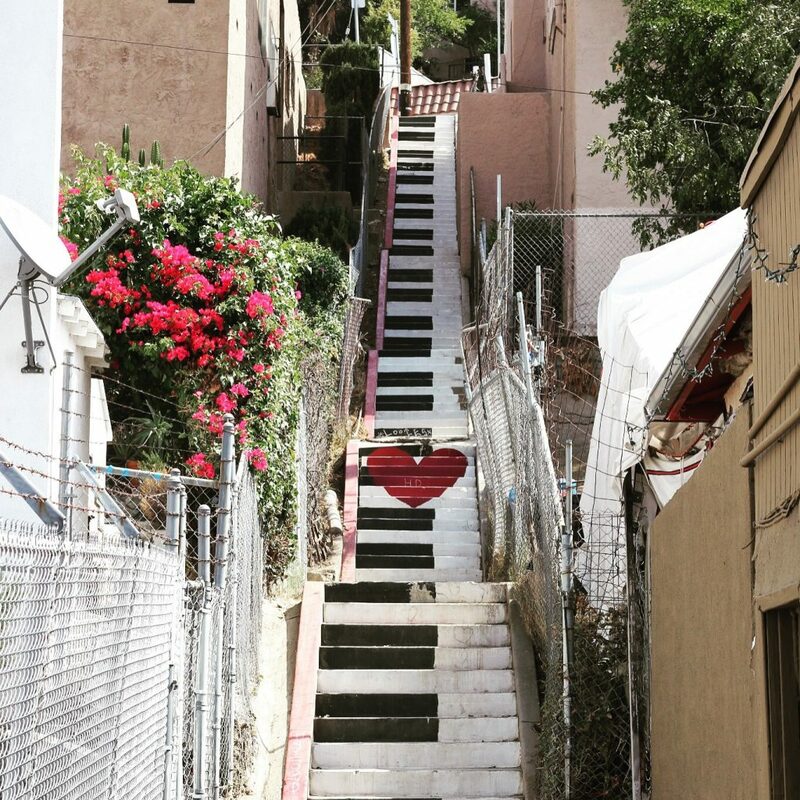 There were some areas of Los Angeles that we definitely liked more than others and enjoyed spending more time in. Now that’s not to say that you shouldn’t explore the other areas that tourists frequent, but these areas stood out to us for things like places to eat, shops and things to see and do. We stayed in a the Line Hotel in Koreatown and although there weren’t many shops in the area, there were plenty of places to eat. Especially the Korean BBQ restaurants which we highly recommend in our places to eat section below. There’s also a metro station that stops in the middle of Koreatown should you want to get off and explore some of the local eateries. 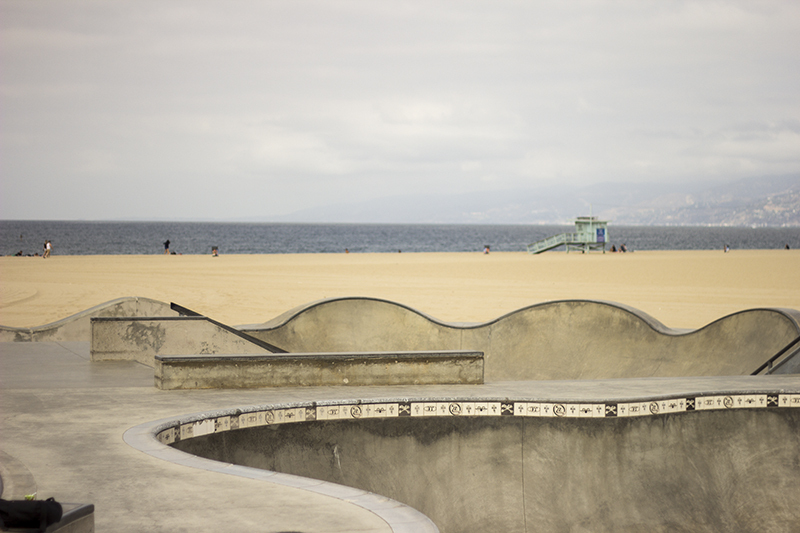 Near the top of our must visit places in Los Angeles would have to be Venice. area really has that laid back LA vibe. Walk along the promenade and take a look at the stalls of crafts and paintings or grab some caffeine in one of the many coffee shops. 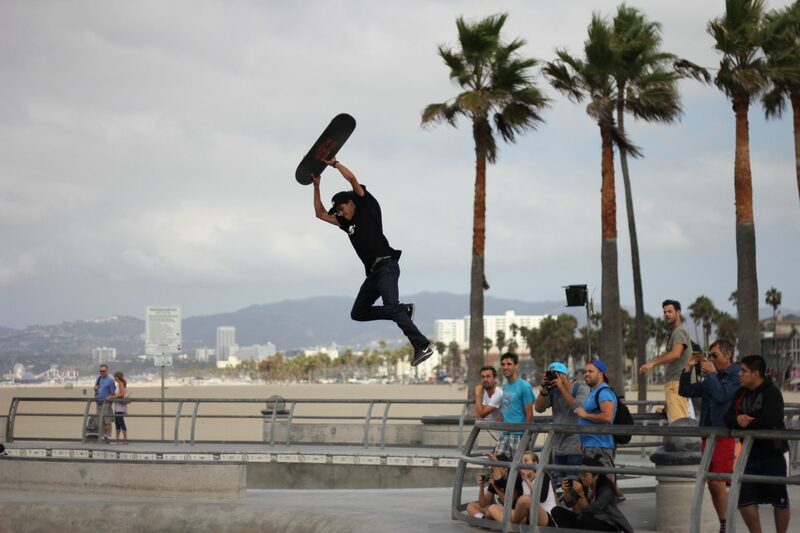 Venice beach is also home to some pretty well known locations such as the skatepark that has featured in many music videos and the original Golds Gym where bodybuilders like Arnold Schwarzenegger and Lou Ferrigno trained back in the 70’s. 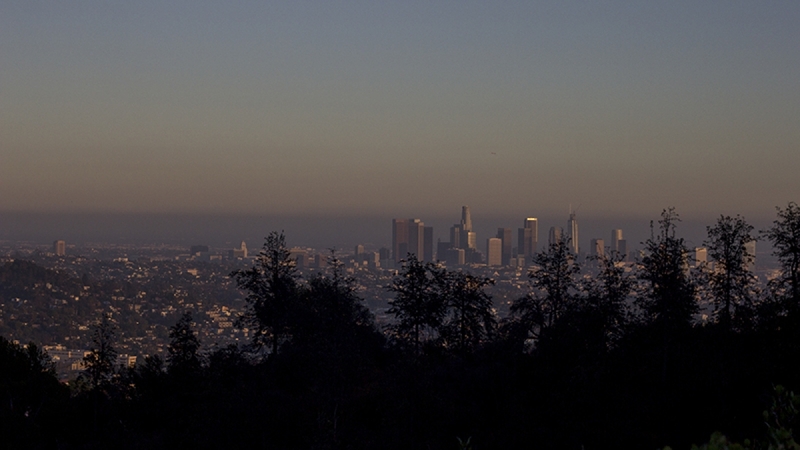 Home to the rich and famous, you can’t visit LA without seeing how the other half live. Take a walk down Rodeo Drive and window shop luxury brand stores like Louis Vuitton, Gucci and Prada to name but a few. You’ll probably be most familiar with Rodeo Drive if you’ve ever seen the films Pretty Woman and Clueless. Beverly hills is what I imagined all of LA to be like. Lots of shops, lots of people who care about their appearance and lots of people with money when in reality that’s just a small part of how LA actually is. Santa Monica was by far our favourite area of LA. It had everything you could want from a location. Lots of shops, lots of places to eat and lots of things to do to keep you entertained for days. 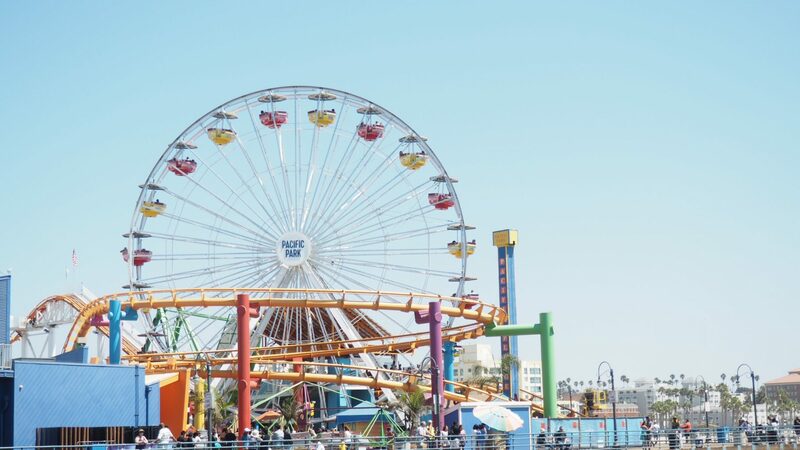 One of the biggest attractions of Santa Monica is that the Santa Monica pier is the end of Route 66, the highway that stretches across most of the US. 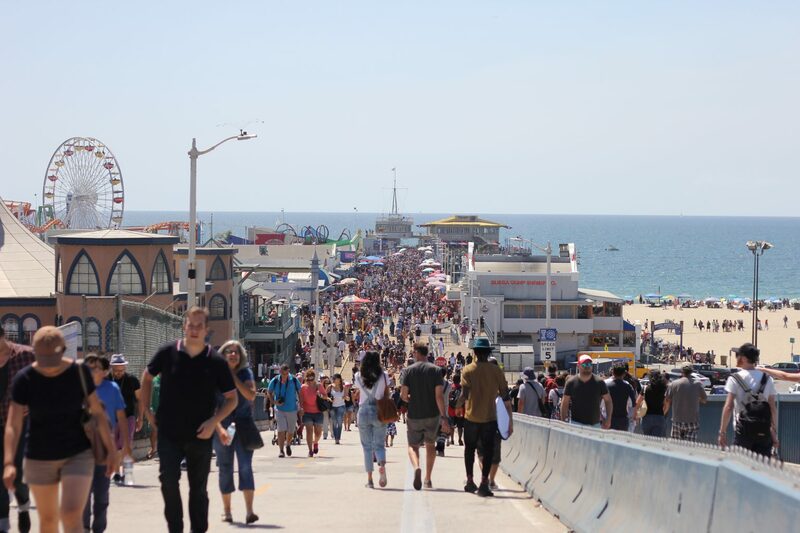 On the pier, you’ll find restaurants, arcades, roller coasters and fairground rides as well as lots, and lots of people. It’s a very busy area so if crowds aren’t your thing then it may be a bit much for you. Oh and definitely hire a bike and cycle the path from Santa Monica to Venice beach and back again. It’s a must. 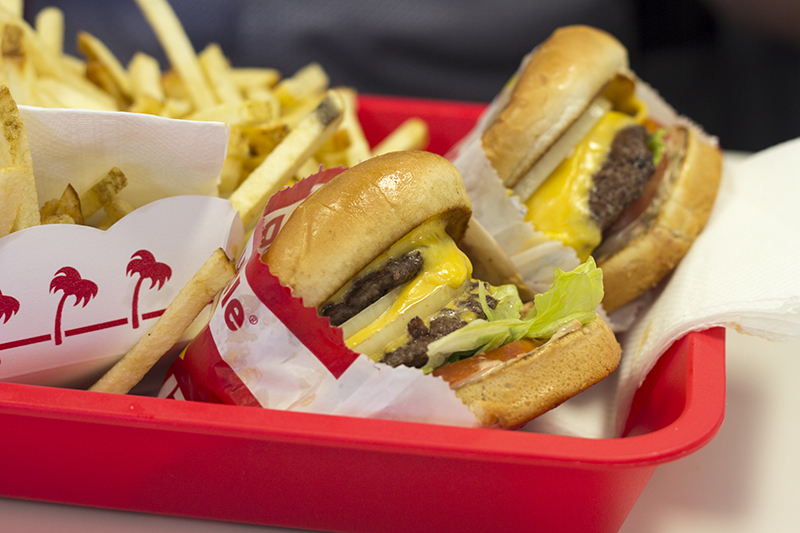 Now it’s time to get to the best part of this guide and that’s the places to eat in LA. There’s just so much choice in the city that it’s hard to pick favourites, but we’ve done our best to include the places that we ate and think were worth a shout out. 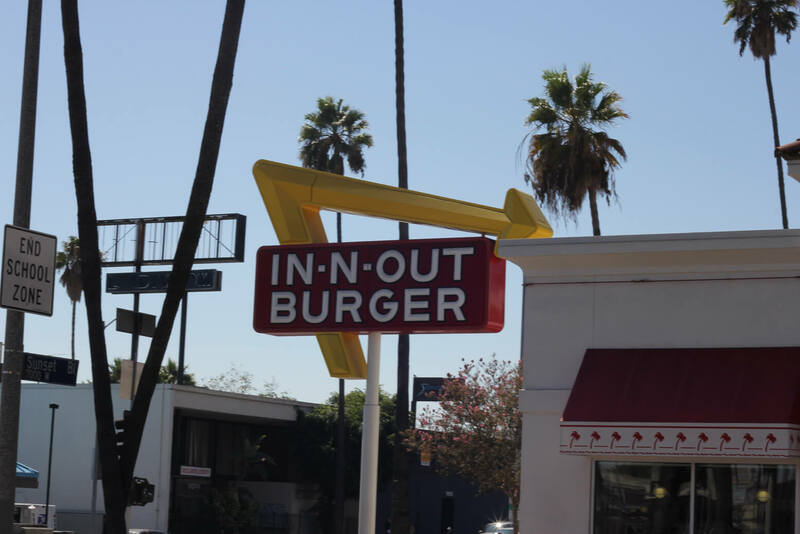 First on the list is a place that is probably top of many lists for people visiting Los Angeles or just the United States in general and that is In-N-Out. In-N-Out seems to have gained a somewhat God like status from burger lovers around the world and it was definitely somewhere that we had to check out. 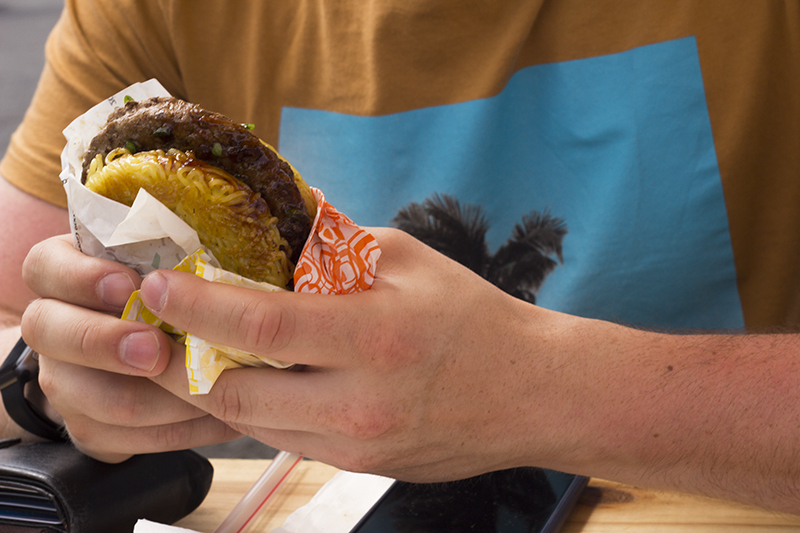 The queues are quite big, but if you like burgers than it’s probably worth it. My suggestion would be to go for a double double which is effectively a double of everything burger. You may as well go big if it’s something you don’t get very often or don’t even have in your country. They also have a “not so secret menu” if you feel like going even bigger. 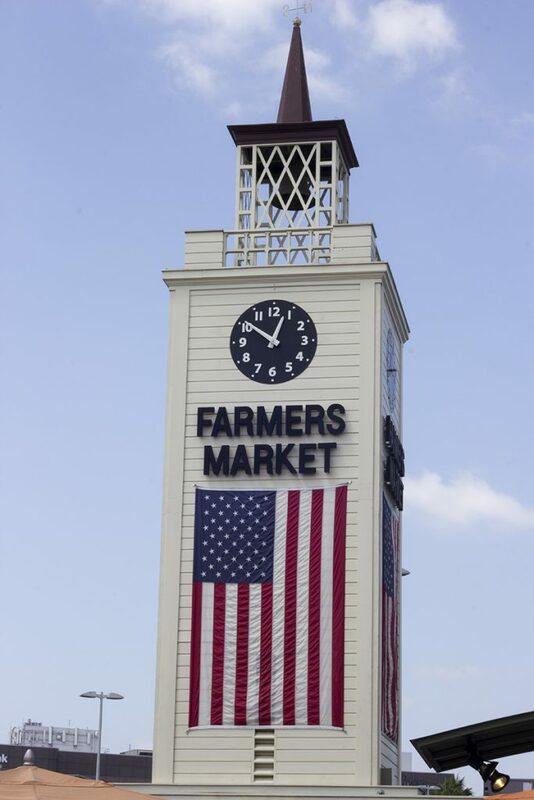 One of our favourite food places was the Farmers Market at the Grove. If you’ve ever been to Camden in London, it’s quite similar to the food stalls that they have there, where you have lots of different food counters to choose from. Along with food stalls, there are also lots of stalls selling local produce from cheeses and fresh food through to a shop that specialised solely in different kinds of hot sauces. 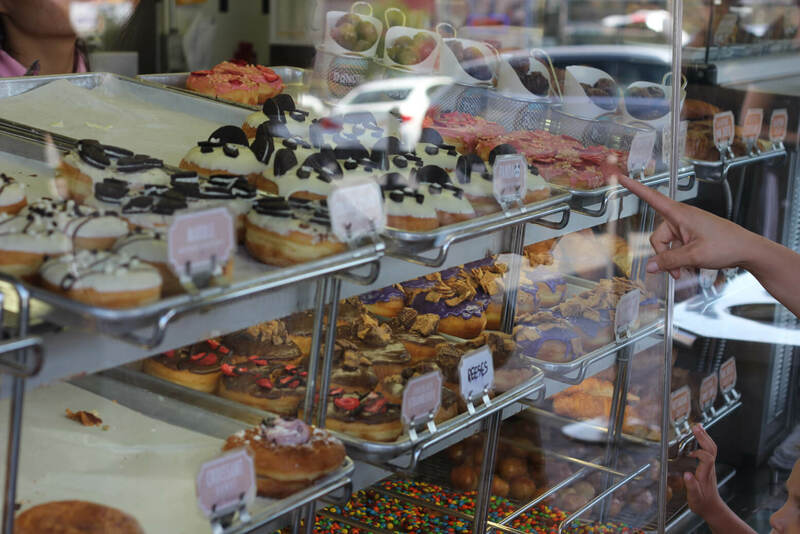 Not somewhere to go for a full meal, but if you love donuts then this is one place that you really cannot miss. 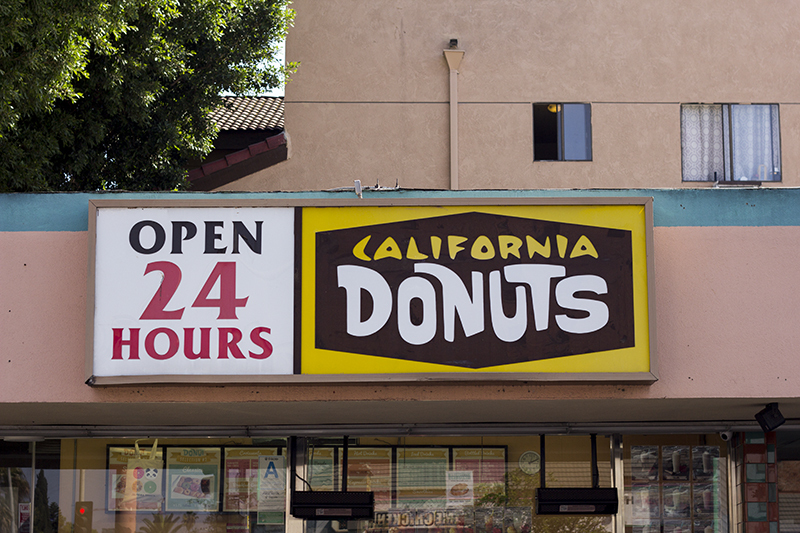 California Donuts specialise in donuts of various funky flavours and styles. 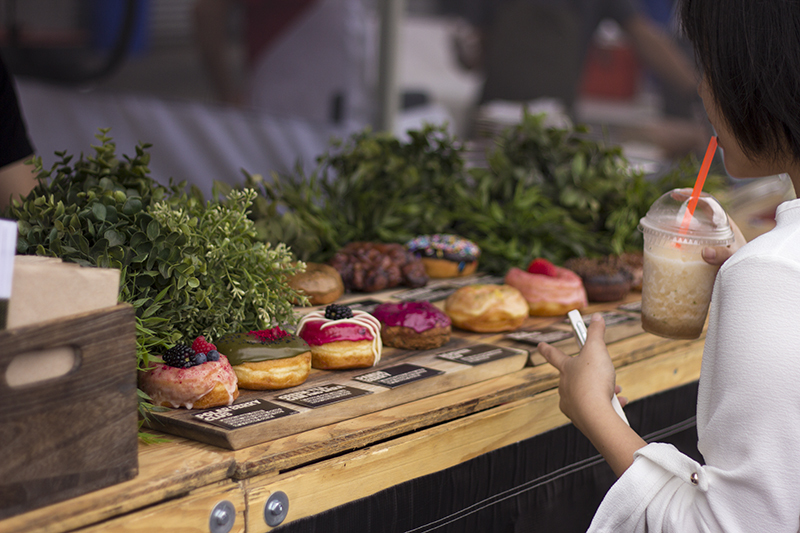 Some of my personal favourites were the Blueberry Toast Crunch donut and the Reeces donut. The awesome thing about this place is the fact that it’s open 24/7 at multiple locations across the city. Midnight donuts are so good. Be warned though, there’s a lot of flavours to choose from so you could spend a while making up your mind. Another of my favourite places to eat whilst visiting LA were the Korean Grill restaurants. Luckily, we were staying in Koreatown, so we had plenty to choose from. Basically you get a selection of meats and other foods that you grill yourself on a mini stove in the middle of your table. Allowing you to get the freshest food as soon as it’s cooked. I’ll be honest that I wasn’t too sure on the idea to begin with, being a little out of my comfort zone, but it’s definitely an experience that you must do when visiting the city. And the food was great. Although it sounds a bit weird, it’s actually one of the best food markets that we’ve ever been to. 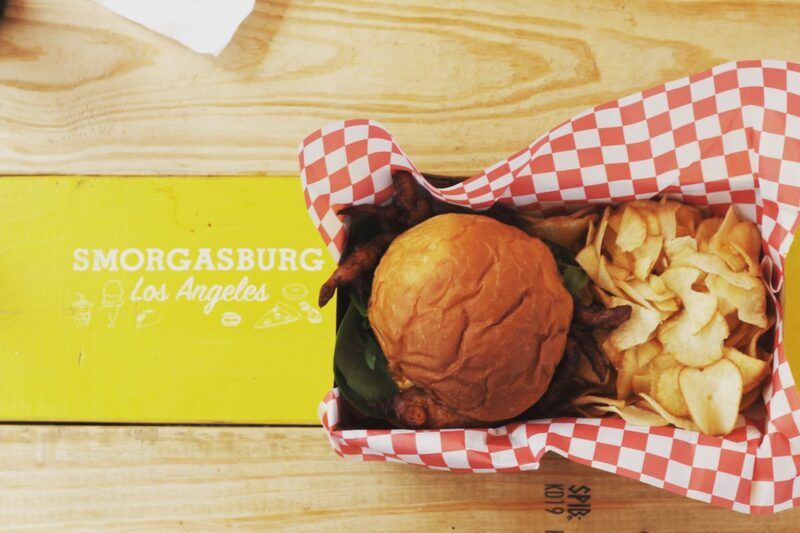 Smorgasburg is a weekly market that takes place in Downtown LA on Sundays that showcase food and lifestyle vendors selling their wares. 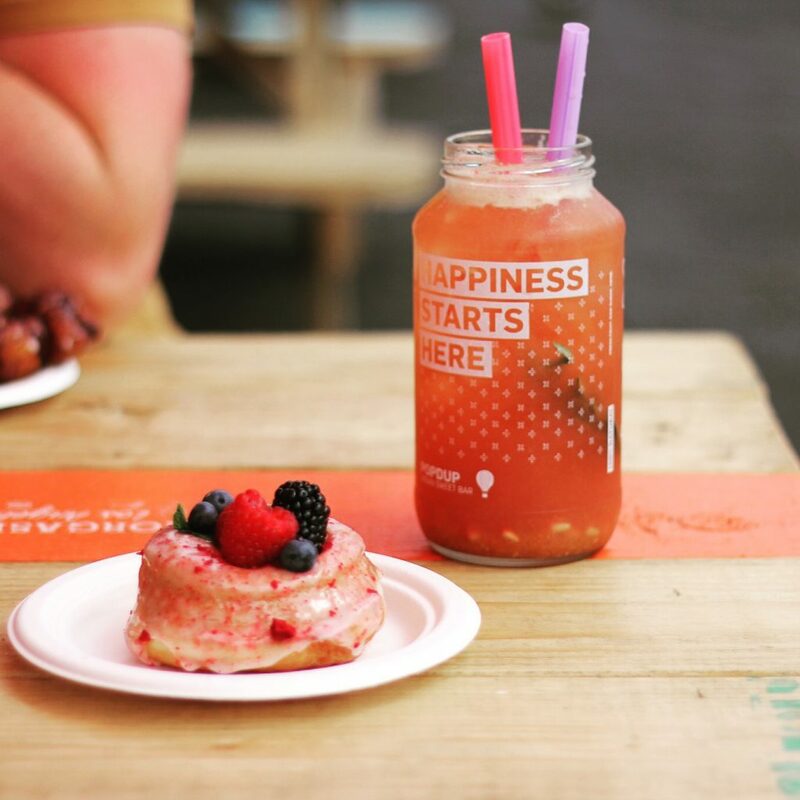 From raindrop cakes to ramen burgers you can find a whole range of street food combinations that you never even knew existed. 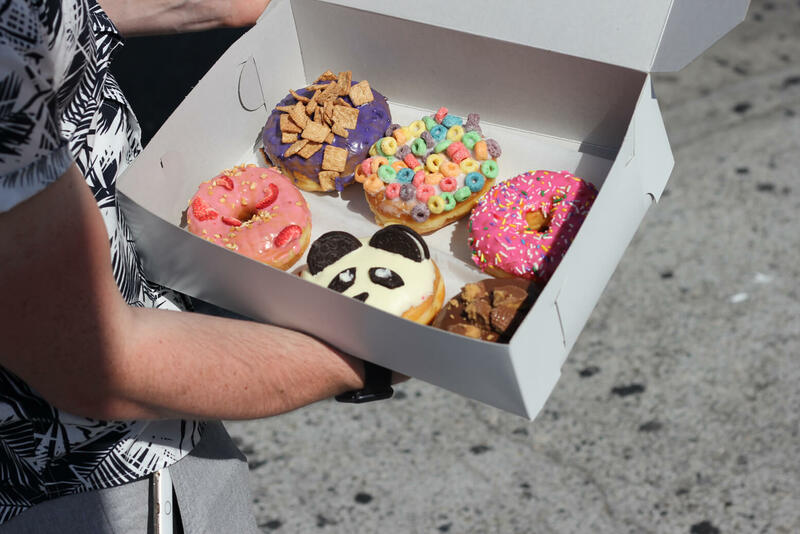 It is a little bit out of the way if you are planning on using the metro to reach downtown LA, and we wouldn’t really recommend walking from the metro station to Smorgasburg LA. If you are going, then definitely get a Lyft or Uber straight to the location. In a city this big, there are no shortage of things to see and do. That’s why it was quite difficult to pick out our favourites, but we managed…..just. 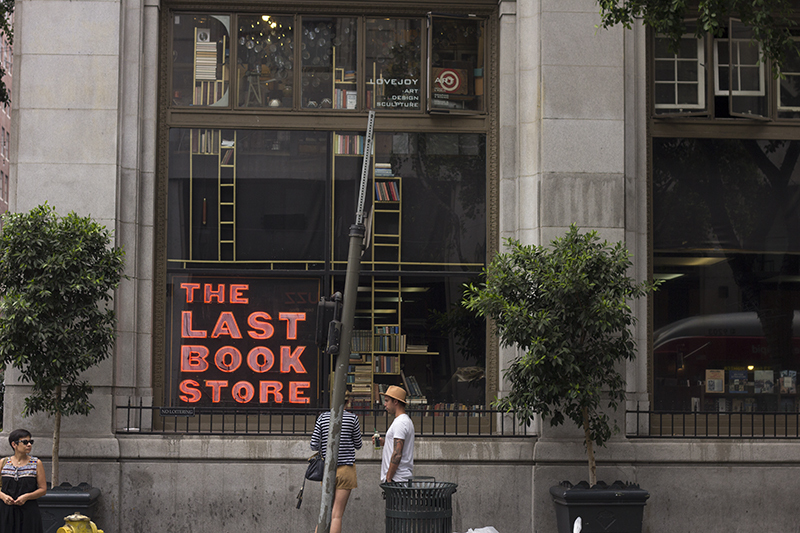 This bookstore can be found in downtown LA and is a treasure trove filled with thousands of books spanning numerous floors, rooms and secret vaults. 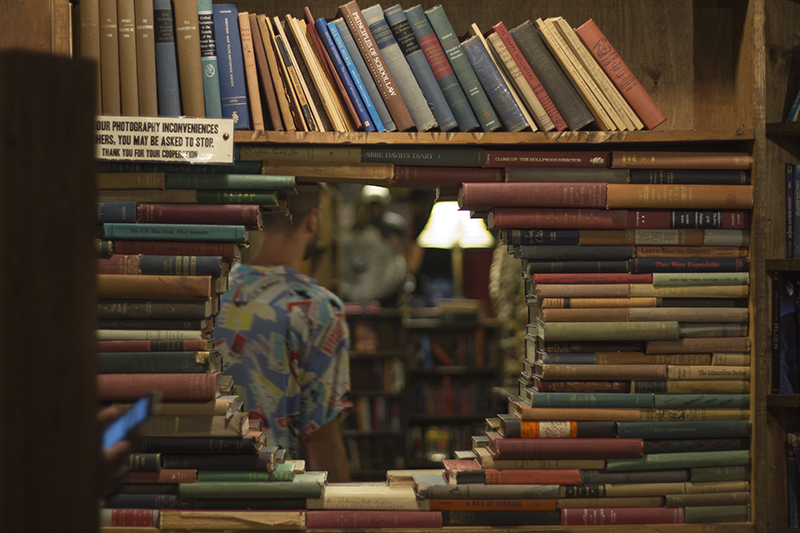 There’s so many books that they’ve even built some of the walls out of them! One of the most prominent sights in the city has to be the iconic Hollywood sign. I’m pretty sure you already know what I’m talking about here but here you go. It can be seen from many parts of the city and is around a two hour hike from the Griffith Observatory to reach the sign but it is worth it to be up close to something so iconic. Be warned though that it does get pretty hot, so be sure to take plenty of water with you especially if you’re doing it in the midday sun. 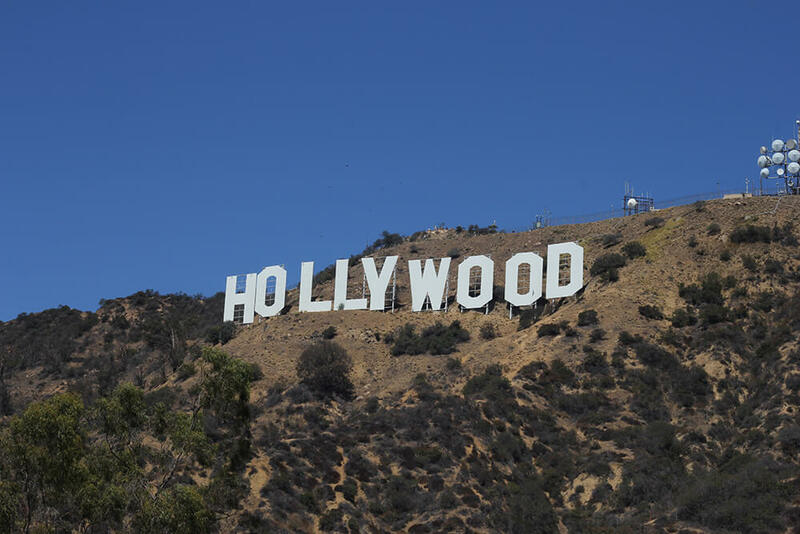 An alternative to walking is to book a horseback ride to the Hollywood sign. The views from the sign overlooking the city skyline are an amazing sight to see. Make sure to tick this one off the list. 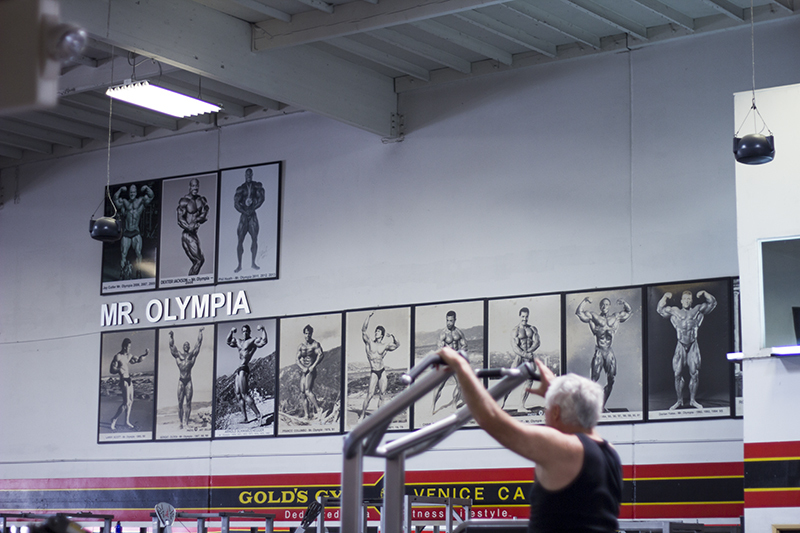 If you’re a bodybuilding fan like me or even just a fan of Arnold Schwarzenegger then going to the place where the journey of many Mr Olympia winners started is a must, but don’t be fooled by the giant modern looking Golds Gym that you’ll find in Venice and thinking that this is where it all began. 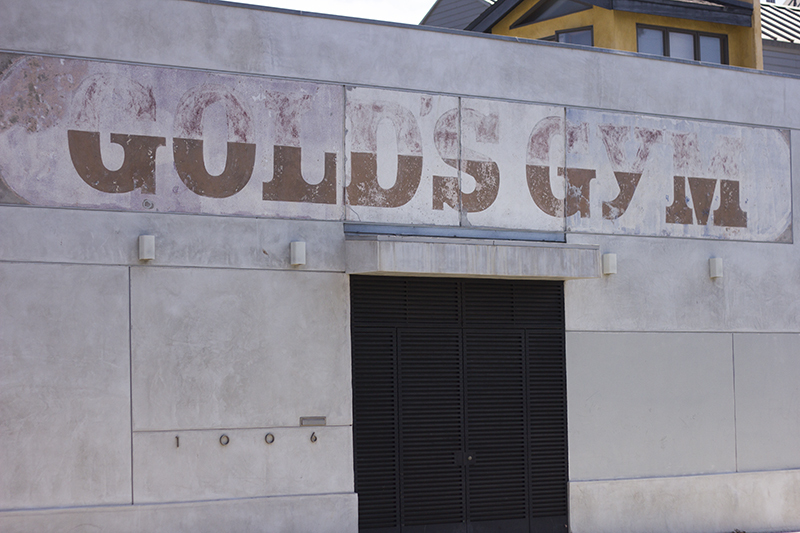 A few streets away you’ll find the real home of the original Golds Gym. A much smaller blue building with a slightly faded exterior and the faint lettering spelling out the iconic name is all that is left. You can also go inside the new golds gym and see the photos on the wall of all the previous Mr Olympia title holders from the very first winner, Larry Scott right up to present day title holder of Shawn Rhoden. Another iconic piece of LA that you’ll probably recognise from the countless photoshoots, music video appearances and that news broadcast where the reporter got smashed in the head with a flying skateboard. 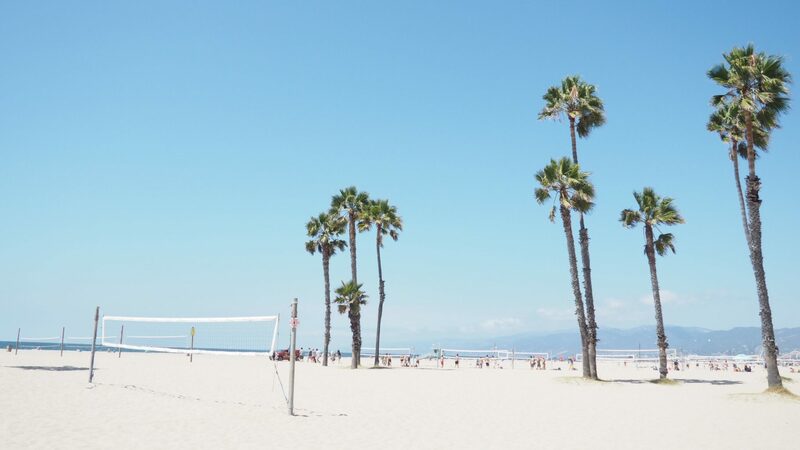 This famous park has been an attraction for tourists to catch some of the impressive display of skills for many years and with the picturesque setting of the beach behind it, we definitely encourage you to go check it out if you’re in the area. This old tram took people from one street level up to the next and is something that you don’t see in many other cities, if anywhere else in the world. Not in the original location, this was dismantled and moved to the current location many years ago and only recently was reopened to the public in 2017. Unfortunately when we visited it wasn’t in use, but you can now pay a dollar for a one way ride, either up or down on the fernicular. 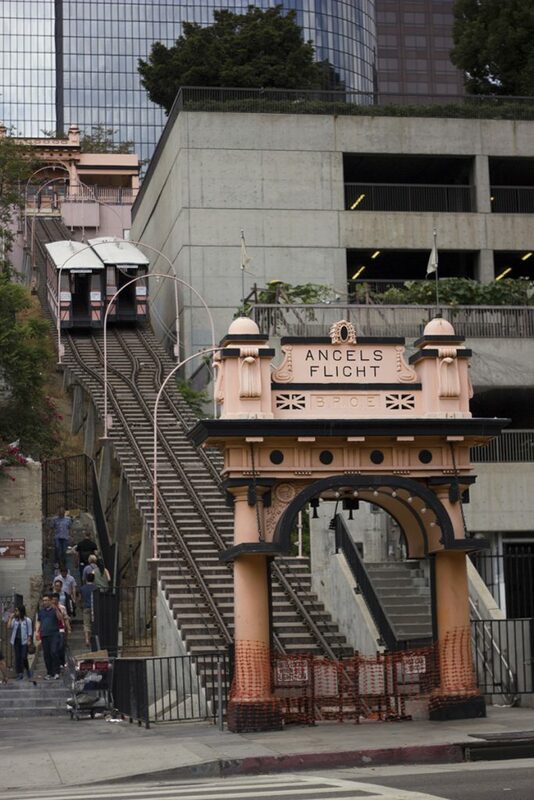 Even though we couldn’t ride on it, Angels Flight still makes for a fantastic photo opportunity. 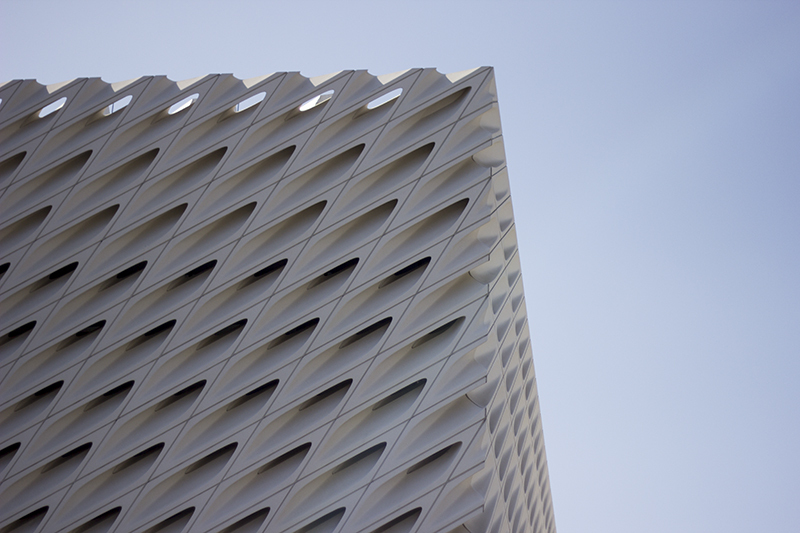 Opened in 2015, the Broad is a contemporary art museum based in Downtown LA that has one of the most standout designs of any building in the city. Instantly recognisable by it’s unique shape and perforated exterior, it’s definitely somewhere that you will want to go and grab some photos of. It’s also directly across the road from the Disney theatre which is another incredible piece of architecture. The Broad is free to access the permanent exhibitions but you will have to pay a fee to see any of the rotating exhibits on show. Unfortunately the Broad had newly opened when we visited the city so the queue went for miles, so we didn’t get to venture inside, but from peering through the windows it definitely looks worth the trip. Oh and be careful for the bulging pieces of sidewalk, they’re a piece of art in themselves. Dotted around the city you will find countless pieces of wall art, from subtle graffiti right through to stunning intricate pieces that almost encourage you to photograph them. Many of the most famous murals including the Paul Smith Pink wall can be found in the Melrose area of the city and there are plenty of guides giving you print out maps to find many of them. 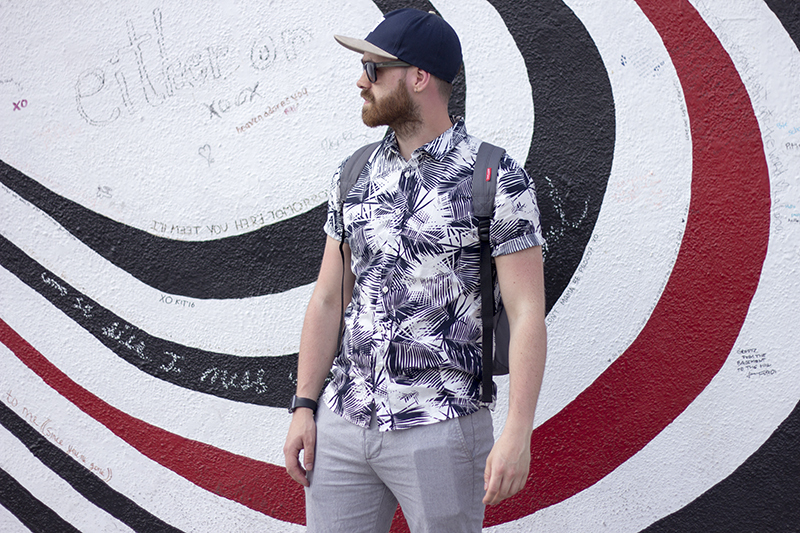 We quite enjoyed seeing a lot on Sunset blvd, although to be completely honest, there are so many pieces around the city that I think you’ll probably struggle find a wall that hasn’t got some incredible artwork on it. There’s something quite amazing about watching a sunset. Regardless of where you are in the world, it’s a beautiful sight and one of our favourite places to watch the sunset in Los Angeles was up at the Griffith Observatory. 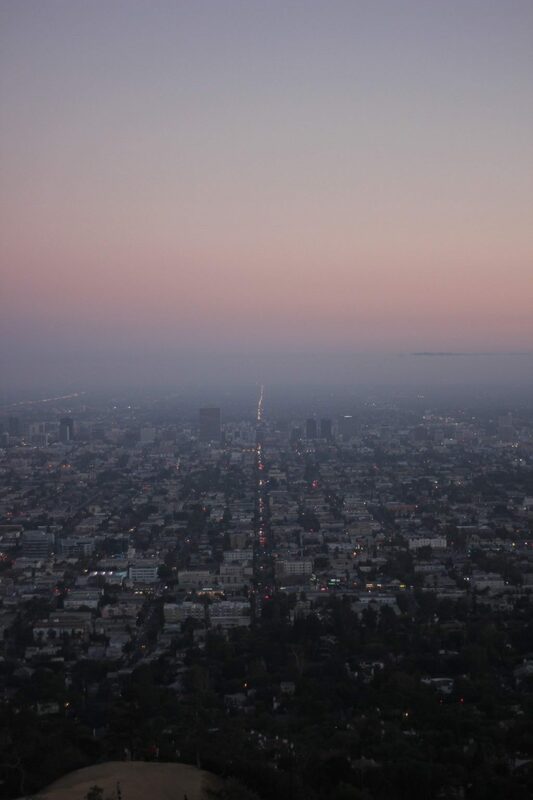 With views overlooking the city for miles and beyond, you are treated to this stunning pink hue over Los Angeles that just takes your breath away. Be warned though that this is one of the main points in the city that people head towards to catch the sunset so it will be busy and it will be harder to get to with the traffic so be there in plenty of time to get set up in a good spot. I imagine that with the release of La La Land and the famous scenes filmed at the Griffiths Observatory that this is an even more popular spot now than it was before. 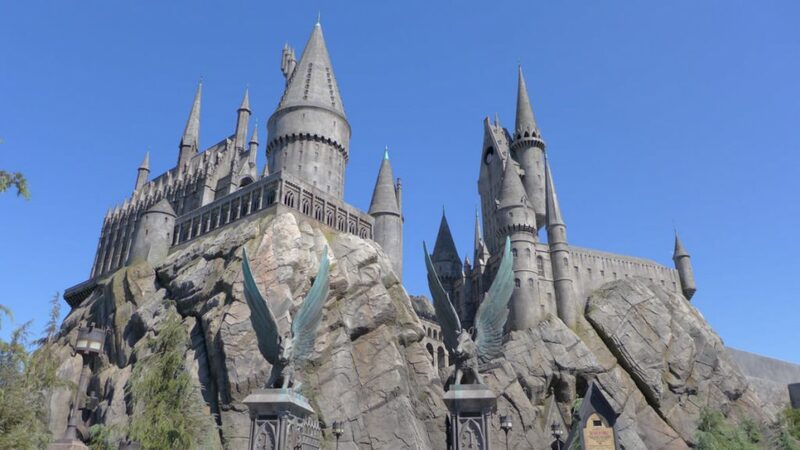 You can’t visit the home of movies without taking a trip to Universal Studios Hollywood. Here you’ll find a whole host of attractions, rides, movie sets and props and just a generally awesome day out. We went when the new Walking Dead attraction had just opened, but to be honest I was a little underwhelmed by it. I think I expected it to be more like the TV show. Needed to be scarier. 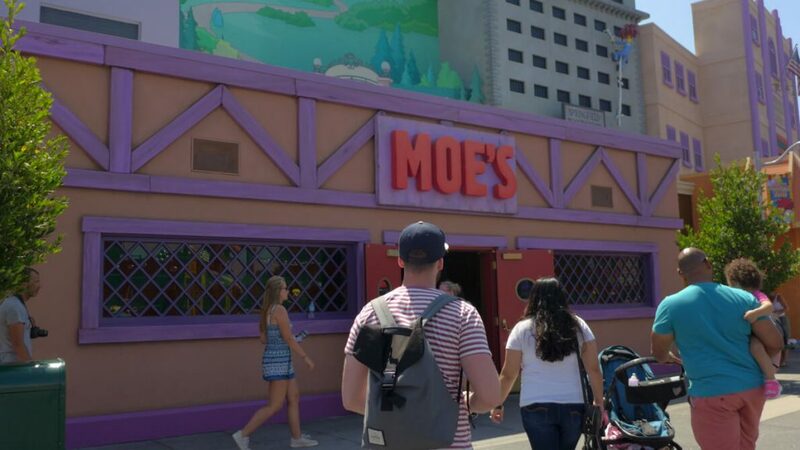 Some of my favourite things to do in Universal were to drink a Flaming Moe in Moes tavern in Springfield, eating at the Three Broomsticks in the Harry Potter area and I think my favourite ride in the entire park had to be “The Mummy”. It doesn’t last long, but boy it is fast. Oh and if you do go to Moes Tavern, be sure to answer the ringing phone on the bar. (Insider tip right there). Last on our list of things to see would have to be yet another pretty famous art installation in the city. Rows upon rows of Street lights arranged in a square section outside the Los Angeles County Museum of Art. It’s definitely a thing to do in the evening when it is dark and the lights are switched on. Finding a spot where you can get a photo without others in it will prove to be hard as it is a very popular attraction, but if you spend long enough there you’ll be able to grab a few great photos. 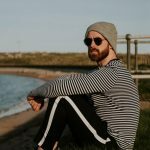 Woah, that was a long post, but I think we covered quite a lot of the city and hopefully gave you some awesome ideas for your trip. If there’s anything you would like to ask for more information about or any other recommendations that we may have missed then drop them in the comments below. We’d be happy to hear from you about your trip to Los Angeles and what you got up to.